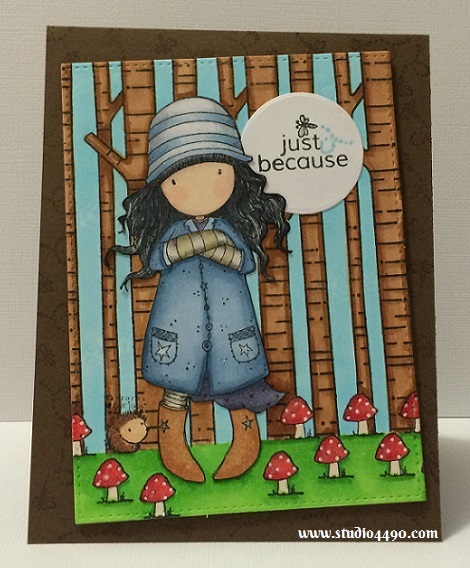 Today I have three cards to share using the Gorjuss stamp set Toadstools. I have had so many ideas buzzing through my head for this set but I’ve decided to limit it (for now!) to three cards. For this series, I have essentially used the same card design but I’ve switched up the colour schemes for each. I think this card set illustrates that simply by changing the colour palette you use, without even changing the design too much, you can end up with a completely different feel. Imagine how many different card looks you can get when you switch up the design as well?! I totally love how versatile stamps are! 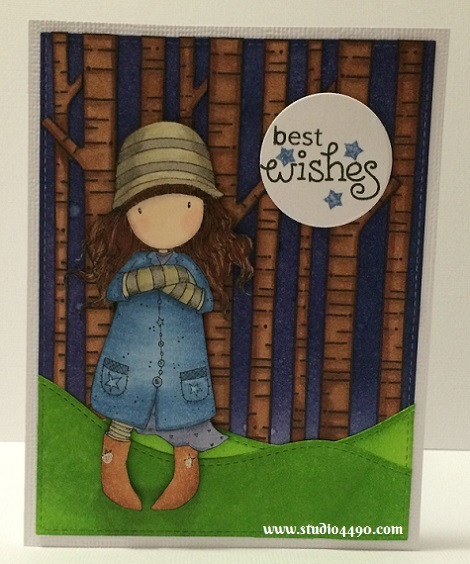 For my first card, I had been playing around with the blues and greys on her outfit which prompted me to put her in a winter scene. Materials used: Stamps – Toadstools (Gorjuss/DoCrafts), Joy to the Woods (Lawn Fawn), A Little Sentimental (Clearly Besotted); Cardstock – Knights Smooth, American Crafts; Dies – Die-namics Blueprints 13 (My Favourite Things), Stitched Hillside Borders (Lawn Fawn), Circles (Sizzix); Copic Markers, and Distress Inks. I decided then to add a bit more colour and a dark night sky was born along with rich green rolling hills. Love the colours of the background. Materials used: Stamps – Toadstools (Gorjuss/DoCrafts), Joy to the Woods (Lawn Fawn), A Little Sentimental (Clearly Besotted); Cardstock – Knights Smooth, American Crafts; Dies – Die-namics Blueprints 13 (My Favourite Things), Stitched Hillside Borders, Let’s Bokeh (Lawn Fawn); Copic Markers, Distress Inks and Wink of Stella. For the final card, I realised I had yet to use the little critter and the toadstools from the set. Of course that had to be remedied immediately. The toadstools are super cute. I had been tempted to go with a darker colour palette but eventually decided on more of a spring time theme. So, there you have it – one stamp set, one basic card design and three different cards. They were so fun to make and I hope you enjoy viewing the cards today. What a fantastic reminder, Kylie! A simple palette change, and you’ve got a whole new card. I love that you used the same supplies, yet came away with very different cards. I can’t decide which is my favorite! I do love that first one with the winter-y white tones. I never would have thought to use that stamp as a Christmas stamp, but seeing it in white definitely gives me some great ideas. Amazing in triplicate, Kylie! I often ‘forget’ that a change of colour is all that’s required to create a ‘new’ card…wouldn’t that save me on taking stuff out, putting stuff away…repeat… The blues and greys of the first are perfect for a winter scene (and, by the way,it’s snowing here! I am not ready for winter! ); the rich browns, greens and navy wonderful for a night scene; and the spring theme…oh my! That little hedgehog, peeking from the trees, is simply wayyyyyy too cute! Once again, you’ve dazzled me with your creativity!